Not every workplace is the same. For many employees, functionality supersedes style when it comes to the garments they wear on the job. Clothing that is durable and comfortable is a must for employees whose work is vigorous or dirty. In some industries, the outerwear we use doesn’t just make our jobs easier; it saves lives. In manufacturing, mining and healthcare, day-to-day processes stay fairly regular, so the personal protective equipment (PPE) used by employees rarely changes. Things are different in the emergency response field. Our job is predicated on the ability to go anywhere spills occur. This can include warehouses, confined spaces, waterways, roads, and office buildings. HazMat technicians can encounter a wide range of hazards while responding to emergency calls. Extreme heat and cold, ice, rain, toxic fumes, infectious materials, and corrosive liquids are all dangers that we can grapple with on any given day. In order to stay prepared, Protect Environmental Services keeps a ready supply of assorted PPE, ranging from latex gloves to Class A suits. Knowing when and where to use PPE is just as important as having it in hand. Using PPE incorrectly can at best make it ineffective, and at worst make it more dangerous than not having it. Sadly, it’s easy to find examples online of employee deaths and injuries caused by a lack of adequate PPE. Safety is one of Protect’s top priorities. We offer cost-effective cleanup solutions that not only ensure the safety of our clients’ employees and the environment, but that of our own employees as well. We believe that everyone should be able to go home at the end of the day, so our HAZWOPER certified responders conduct regular drills on how to properly don and doff the equipment that protects them. Since beginning operations in 1996, we’ve had zero lost workdays due to employee injuries; a record we’re proud of and work diligently to maintain. If your business experiences a chemical spill, calling on Protect Environmental to handle the cleanup is your best move. You can rest assured that Protect will remove contaminants and dispose of the waste in a responsible manner that keeps your business in compliance and keeps your employees out of harm’s way. What constitutes an emergency? Managers may find themselves asking this question at one point or another in their careers. Even though the busy hum of day-to-day operations might make it difficult to plan for ‘what if’ scenarios, emergency situations should be taken seriously. Employers who strive for accident free workplaces through intensive training and maintenance still encounter them from time to time. Weather events, equipment failures, vehicle wrecks, and other unforeseen events can still happen despite the best preparations. When an accident does strike, it’s important to be able to take immediate action to prevent further damage and injuries. A comprehensive emergency response plan gives employers an edge. Employees will know beforehand how to respond to a given situation and have an easier time getting it under control. Sometimes recovering from an accident requires resources that an organization doesn’t have. Spills of chemicals or bio-hazardous substances require specialized training and gear to handle properly. That’s where a company like Protect Environmental enters the scene. Our highly trained teams are on call every hour of every day. They can be dispatched to your site to contain and remove spilled materials when the risk to your employees is too high. After the cleanup is completed, our team disposes of any waste materials generated. Federal and state regulations require proper handling, transportation, and documentation of waste disposal activities. Our professional staff ensure that wastes are received at licensed disposal facilities to keep your company in compliance with strict laws and further reduce your liability. Don’t let a hazardous material spill cost your business valuable time and money: plan for whatever surprises the future holds. You can make Protect part of your emergency response plan at no cost, so feel free to contact our office today. We hope you’ll never have to call us for an emergency, but if you do, we’ll be ready to help you through it. Spills, by nature, are unpredictable. Operations personnel don’t intend to have them. Still, business owners and safety managers can make plans for what to do if a spill does occur. There is a list of actions that need to be taken immediately after a spill to minimize damage and liability. If employees on the ground aren’t prepared to take those actions, the consequences could be crushing. Being prepared for a spill isn’t as difficult as it may seem. By taking certain preemptive steps, you can make sure that everyone needed to respond to a spill is ready to jump into action when it happens. 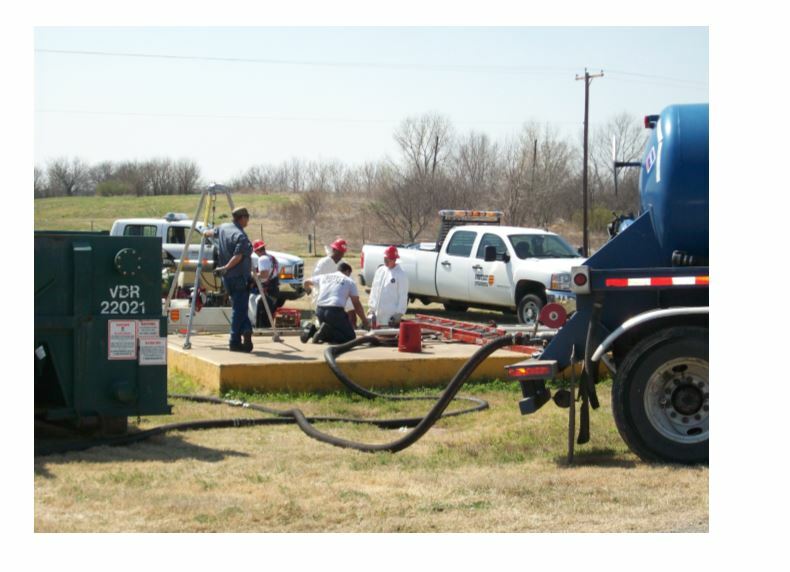 The first step should be to include Protect Environmental Services in your spill response plan. Here are some of the advantages of partnering with Protect. Spill Kit Assistance – Pre-assembled spill kits are available for sale from many different distributors. Kits can vary in size, capacity, and type of material they’re suited for. It’s important to research what is in the kit and consider how useful it would be in your given situations. If you store corrosives onsite, you would want a kit geared toward cleanup of acids or bases. A kit on a large vehicle should have a containment pool that can slide under damaged fuel tanks to capture leaking fuel. You can also build your own custom kits to suit your needs. When you designate Protect Environmental as your emergency response contractor, we can help you figure out what your kits need and where to place them for maximum effect. Spill Reporting – In Texas, spills over certain sizes of specific materials need to be reported to the State’s environmental regulatory agency, the TCEQ. Failing to meet these reporting requirements can result in severe fines. Knowing when and how to report can be complicated, but Protect Environmental offers comprehensive spill reporting to our clients. We make the initial call and send the properly formatted final report within the State’s specified time-frame, removing that burden from companies that just want to get back to business as usual after a spill. Around the Clock Support – Leaks and other accidents don’t keep regular hours. That’s why Protect responds to emergency calls any hour of the day, any day of the year. When you partner with experts who are equipped to provide assistance when you need it, no matter when that is, you enhance your preparedness and minimize your spill-related costs and liability in the long run. Qualified Cleanup Professionals – The staff at Protect are dedicated to getting the job done right. That means that our teams have the training and know-how to respond to your spill in the safest, most cost efficient way possible. We manage the cleanup operation from start to finish, and keep you informed each step of the way. When it becomes necessary to call in additional resources from third parties, Protect only works with vendors who have the same commitment to safety and compliance that we do. Fair and Transparent Invoicing – The moment an emergency call comes into Protect, the paper trail begins. We document all personnel, equipment, and other resources as they are utilized during a spill response. Photographs are taken and logs are kept. When your itemized invoice arrives, you can trust that all expenses incurred during the response are legitimate and fair. For these reasons and more, you can count on us to help your company overcome the obstacles that HazMat spills put up, such as fines for non-compliance with cleanup and reporting regulations. Let your employees know who to call when disaster strikes. Stickers and cards with Protect Environmental’s contact information are available upon request. The world of environmental services can be a complicated place. It encompasses areas of industry such as workplace chemical exposure levels, waste management, pollution control, emergency response, contingency planning, and site remediation. Successful contractors have to be well versed in all these areas and more. They also have to realize that each client is unique, and so are their environmental needs. Since 1996, Protect Environmental Services has been dedicated to handling the needs of our clients in a safe, lawful, and cost effective manner. There’s no mystery why Protect is a preferred contractor for state agencies like the Texas Department of Transportation and the Texas Commission on Environmental Quality, along with countless municipalities and businesses. Our professional and experienced staff take your needs seriously . We know that delays, mistakes or miscalculations can cost our clients more than money; they can cost lives. We take pride in doing the job right and communicating effectively with our clients to ensure they receive the best outcome possible. Feel free to contact our office by phone or email to find out how Protect Environmental can improve your environmental services experience. Like most industries, environmental services are constantly changing. New regulations, emerging technologies, and evolving client demands mean that environmental contractors should always be adapting. Additional methods for removing and remediating surface and soil contamination sometimes enter the market, but they aren’t universally applicable. Each spill situation is different, so there’s no one-size-fits-all solution to handling chemical spills and waste disposal. At Protect Environmental, we work with a wide variety of tools to get the job done, and utilize the equipment and methods that best fits the need. Depending on what was spilled and where, the best equipment and methods could include recovery scrubbers, street sweepers, pressure washers, oil skimmers, front end loaders or vac trucks. We put our clients’ needs first, and they count on us to find the methods that will solve their environmental problems economically and efficiently. Once an emergency response call reaches our office, our staff ask for information about the spill. We then quickly assess what needs to arrive on site, knowing that sending unnecessary equipment and personnel wastes time and adds expense to the cleanup. Even with some advanced knowledge of what we’re walking into, emergency response situations can be complicated and dangerous. We’ve handled thousands of spills in the twenty-two years that Protect has been responding to HazMat incidents, so we always maintain a mindset of preparedness and caution. In the past, our clients have trusted us with the safe handling and disposal of extreme hazards such as acids, oxidizers, flammables, caustics, explosives, numerous unknown chemicals, picric acid, medical wastes, and Ebola contaminated materials. Specialized equipment can speed up recovery operations, but a machine only works well if it has a knowledgeable operator. The most important asset we have at Protect is our staff. Their unequaled training, experience in the environmental field, and client oriented outlook and focus has made Protect the number one contractor for manufacturers, local governments, state agencies, and countless small businesses. We encourage you to contact our office by phone or email to find out how Protect can help you tackle your environmental needs. Wastes materials are often far from the forefront of business operations. With inventory to track, employees to manage and customers to assist, disposing of waste materials can easily fall to the bottom of the priority list. Since special wastes require specialized handling and disposal, it is often easier to put them aside with the intention of dealing with them later. As waste materials accumulate; however, the danger they pose and the cost to dispose of them steadily climbs. Materials can become wastes for numerous reasons. A chemical product could expire, a process change could render it unusable or it might be left over after a special project is completed. When it’s known that a material is no longer needed and is officially a waste, it’s important to deal with it as promptly as possible. If not, waste materials tend to wind up in the back of a warehouse or storage yards only to be forgotten. As time goes by, exposure to climate conditions can make managing wastes more difficult. Weathering can degrade labels and make identifying wastes difficult. Exposure to rain and sun can compromise the integrity of the packaging, creating a risk of spills. When drums rust or plastic pails become brittle, materials can escape even if the container isn’t moved. Slow leaks can penetrate soil and contaminated large areas over the course of months and years. Eventually, wastes can become unmanageable. The costs to dispose of large quantities of materials and cleanup contaminated areas can put businesses in financial jeopardy. To avoid putting the entire business at risk, assign someone to track and manage wastes, and set deadlines for how long wastes can stay on site. Also, it’s prudent to include room in the budget for disposing of waste materials properly. Cutting corners or using unscrupulous disposal contractors to save money can wind up costing more in the long run. The waste generator is ultimately responsible for making sure their waste winds up where it belongs, so illegal dumping can result in massive fines and jail time for the generator. When you’re ready to clear out your wastes, Protect Environmental is standing by to lend a hand. Our trained staff can handle almost all types of hazardous and non-hazardous materials, and we research different options to find the most practical solution to fit your needs. Waste materials don’t have to drag your business down, so contact our office today and let us know what your waste needs are. December is a time to reflect on the old year and plan for the new one. For businesses, the end of the year is a great opportunity to think about the future and prepare for spills and other unforeseeable events. If your company stores or uses hazardous chemicals such as solvents, cleaners, and fuels, you are at risk of having a spill. Part of any spill plan is having an emergency cleanup contractor lined up before a spill happens. Having pre-existing agreements with a HazMat contractor decreases response times and cleanup costs. Below are just a few of the advantages of choosing Protect Environmental as your go-to emergency spill response contractor. Fast response: Protect has two offices in the Dallas/Fort Worth area and can rapidly respond to spills in the North Texas Area. Our staff are on call 24/7, so no matter where or when your spill occurs, we’ll have a team ready to handle the containment and cleanup. Detailed Record Keeping: From the moment our teams are called to respond to a HazMat spill, they’re busy gathering information and taking notes. Accurate information is essential to conducting an efficient and effective cleanup, so our teams take photographs, make maps and record every action taken to respond to the spill. State Mandated Reports: Spills of various materials have different reporting requirements. In Texas, spill reports must meet certain criteria and be submitted to the TCEQ in a specific time frame. Failure to do so could result in hefty fines and other penalties. When Protect cleans up a spill, we use our detailed records to compile a report for the responsible party to ensure their compliance with State laws. Fair and Transparent Billing: At Protect Environmental, we believe that our clients deserve the best treatment possible when misfortune strikes. Our staff know what they need to get the job done and work to use the most cost effective solutions when responding to a spill. Our clients can count on us to have their best interests in mind so there won’t be any unnecessary or exaggerated costs. Peace of mind: The work we do is important to us, and we take pride in doing the job the right way. We handle the job from start to finish, and don’t take shortcuts that put our employees or clients at risk. We make sure our clients legal obligations are met; keeping them in compliance with government regulations and eliminating their risk of fines due to improper cleanup and waste disposal. Partnering with Protect Environmental means you’ll be taking another step toward minimizing your company’s liability should a biohazard or chemical spill occur. By planning ahead and developing a contingency plan for spills, you’re increasing the odds that your company can successfully recover from the unforeseen. Contact our office today and we’ll help you start the new year off with a solid spill plan.